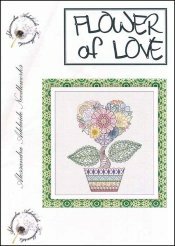 Flower Of Love [C6910] - $15.88 : Yarn Tree, Your wholesale source for cross stitch supplies. Cross stitch pattern by Alessandra Adelaide Needleworks. Several smaller flowers form a heart shaped bloom growing strong in a decorative pot. Stitch count 250w x 310h.